A few days after I finished The Leadman series I was asked to write an article for our runners club monthly newsletter. Mind you, there is a 750 word limit and I told the requester there was no way I could condense the story to that limit. She told me she was a professional and ended up editing it down for the news letter so I thought I would publish the original condensed version that I had submitted to her since much of the content that provided “the feeling” was left out..
I’ve seen this quote many times but the author is never noted. It has rung true with me in my business career, accepting risky new assignments and positions at companies I’ve worked for, and in starting my own business. It has also rung true with my late in life involvement in endurance sports. 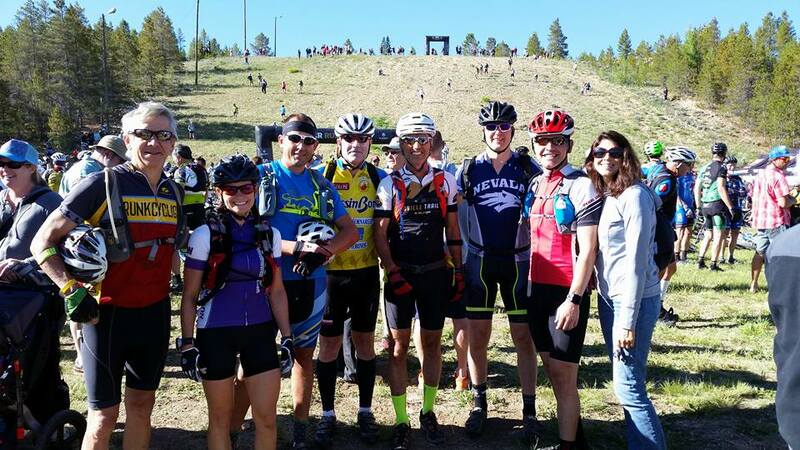 I signed up for the Leadville 100 mountain bike race lottery this year with a group of guys and just assumed we would be selected again since raced it last year. In January we learned we did not get selected. 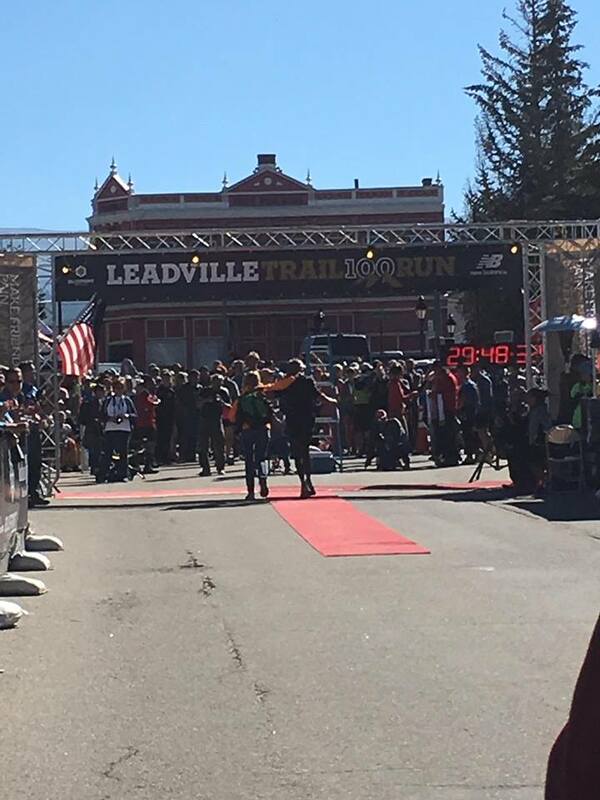 I had several other friends get in, and a bunch of other friends that got into the Leadville 100 mile run. After becoming burnt out on Ironman training in 2015 I knew I needed a year off from Ironman. 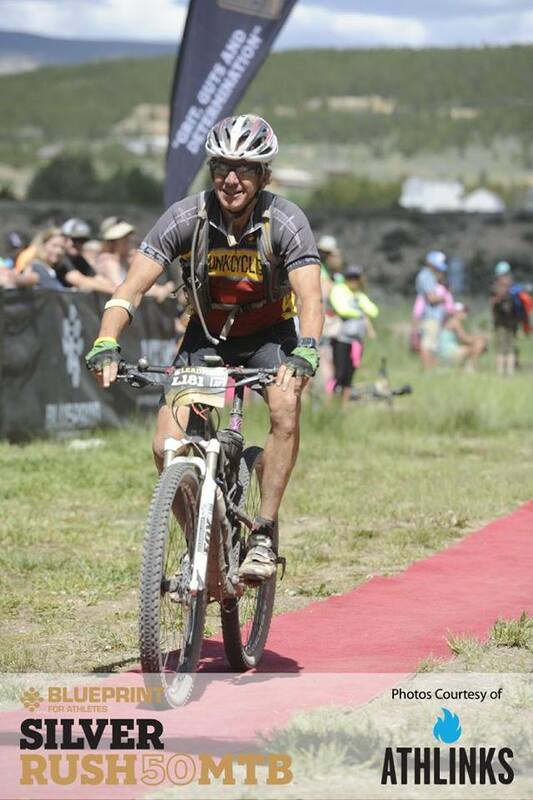 Since I didn’t get selected for the LT100 MTB race I only had the ITU Long Course World Championship on my race schedule for the year but had a lot of friends doing the Leadville 100 mountain bike race and run. I had two friends, Amy and Alliison, ask me to pace them for the 100 run but that just wasn’t the same as racing. I heard about the Leadman series from Byron Benoit, a few years ago, when he spoke of Jeff Bennett doing it. After some encouragement from Jeff, and my uncanny skills convincing three other friends to register, I had a race series to focus on for the summer. 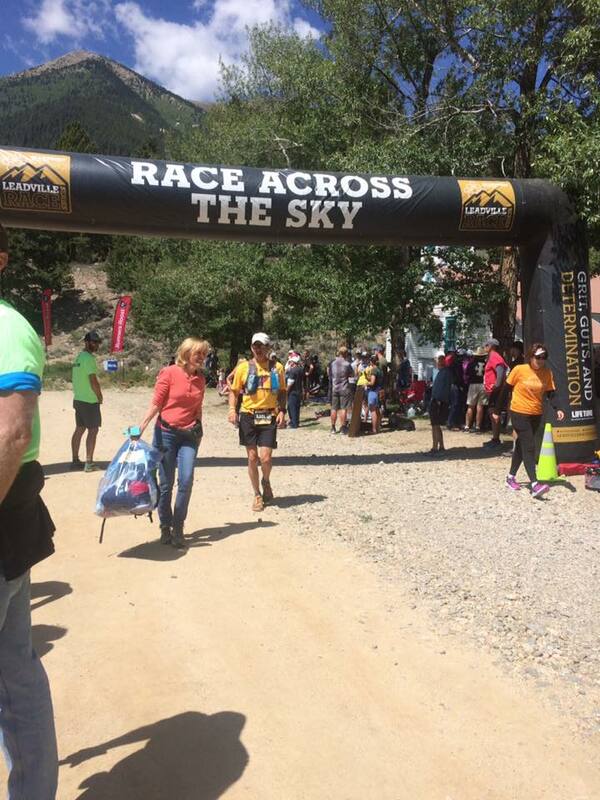 To be a Leadman you need to complete the Leadville trail marathon in June, either the Silver Rush 50 MTB or 50 mile trail run in July, The Leadville 100 MTB on the second weekend in August, the 10K the following day, and the true test, the Leadville 100 run the weekend after the MTB race. 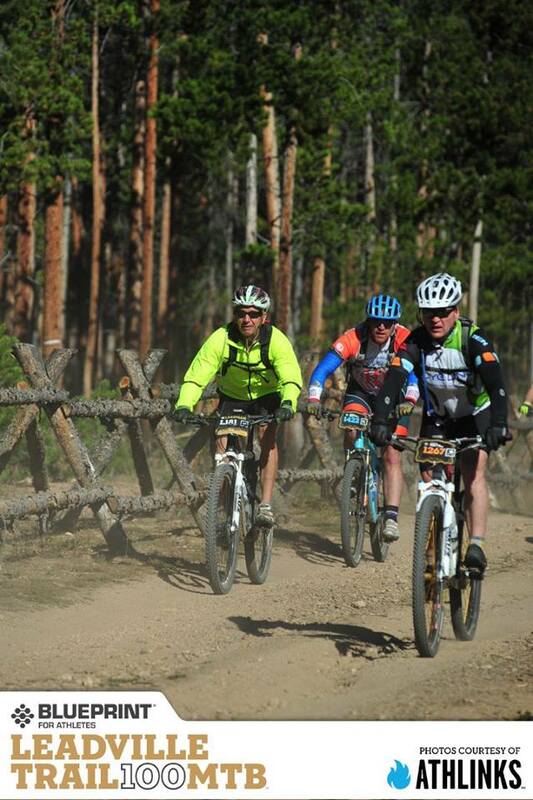 I had already raced the Silver Rush 50 MTB and Leadville 100 MTB races the year before. The only event that scared me was the 100 mile run. I’d never run more than 50 miles and this was in mountains and mostly above 10,000 feet in altitude. 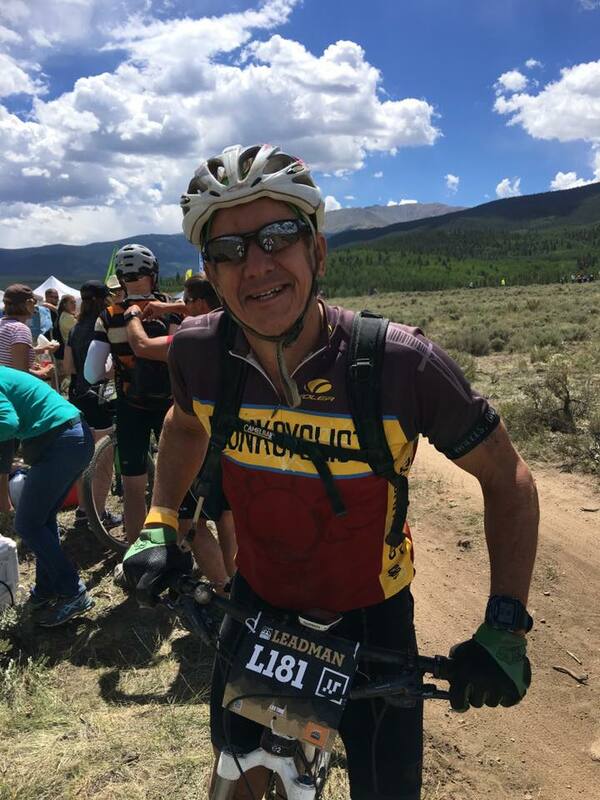 I wasn’t concerned so much about the 100 mile run because the main reason I signed up for the series was so I could do the LT100 MTB race and figured what ever happened during 100 mile run would happen (see quote at the top). I consulted with Jeff and Chris Barnwell on how they would approach the training. I started to develop a case of PF (Plantar Fasciitis) training for Ironman Florida in late 2015. I had been fairly successful fending it off for several months but it started getting worse. After the Kalamazoo Marathon (K2’s 48th state) I could hardly walk but it did not bother me during the race. 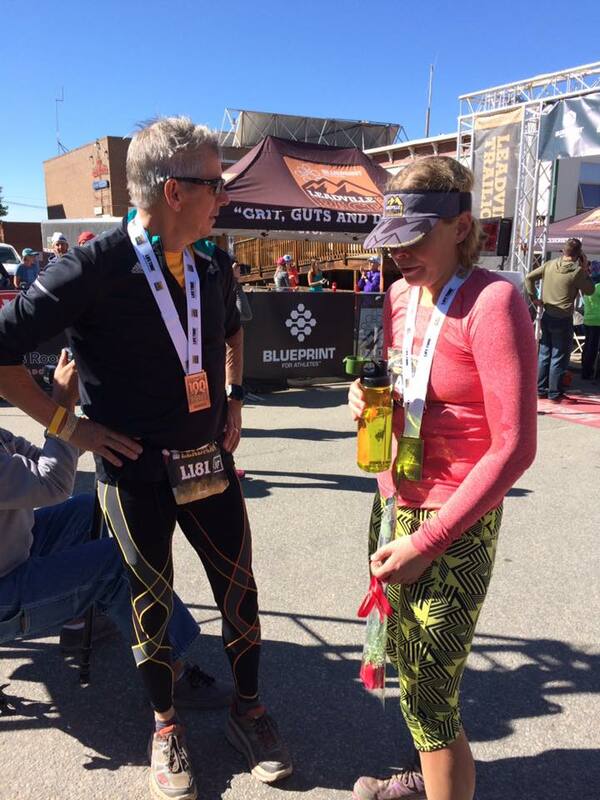 In late May I ran the Jemez Mountain 50 mile trail run and by mile 16 my PF was on fire, and both knees hurt on descents so I dropped to the 50K and basically walked in the last 17 miles. My confidence in my body being able to complete a 100 mile run was pretty shaken. I am by nature a very competitive person. All the training I’ve done in the past has been to try to set new personal bests, and podium in the 40+ category. To be a Leadman all you have to do is finish all the races in the series by the cutoff time. Although they do track all the results by age group there are no age group awards. You either are a Leadman, or you aren’t, only overall winners get awards. This was a very difficult mindset for me to get into and thru the entire event series found myself reminding myself you don’t have to win, just beat the cutoff time and enjoy the race. 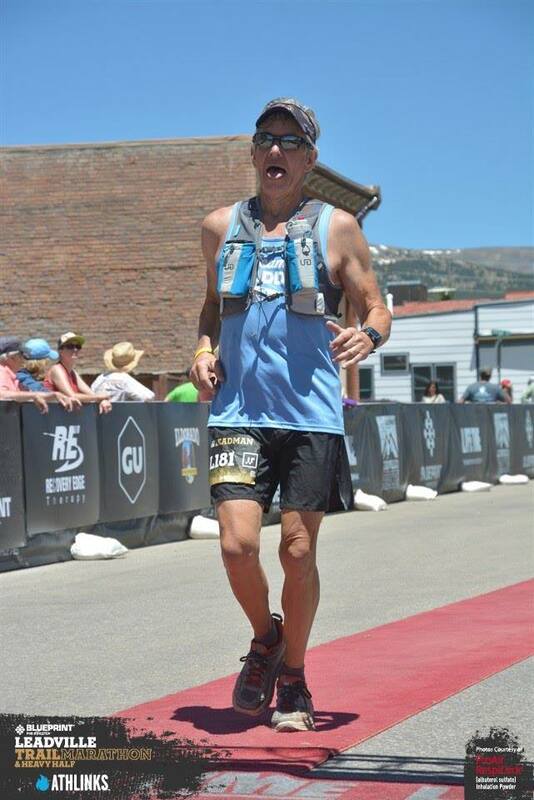 June 24th Leadville Marathon: I wasn’t too worried about this race. I arrived two days early because I wanted to get a 3-4 hour ride in the day before to see if I could do both the Silver Rush 50 MTB race and the run which happened the day after. 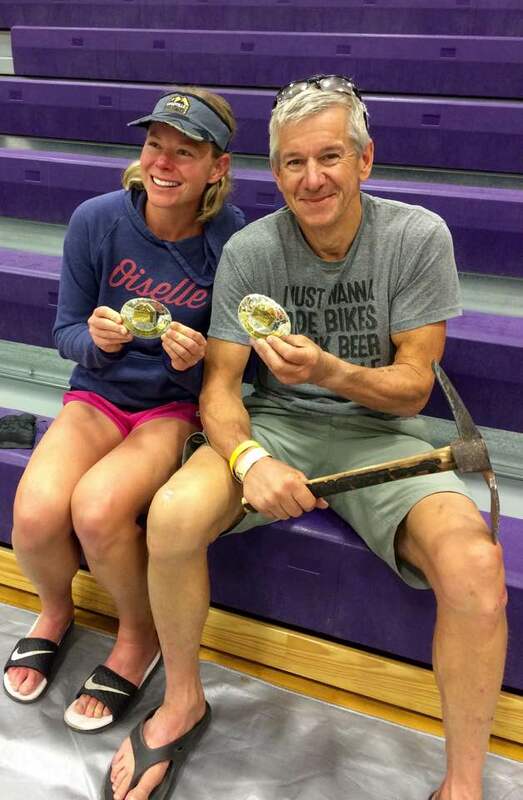 One of my goals after talking to Jeff Bennett was to get the Silver King award as well, which you get by completing both the 50 mile MTB race on Saturday and the 50 mile run the following day (Crazy you say? Read the quote at the top). I felt great riding and running at altitude after the first 10 minutes of being out of breath both days. I took it easy during the marathon thinking I’d run it at ultra pace just to see how I felt at the end of the race to provide confidence for the 50 and 100 mile runs coming up. After the midway turnaround at the top of Mosquito Pass (13,000 feet elevation) people were passing me bombing down technical sections and climbing the last hills. Although I finished well before the cutoff I placed very low in the overall and age group standings. I must admit I kicked myself a few times for taking it easy and not running harder. My PF did not bother me much during the race but was painful after the race so I decided it was time to go see Dr. Mary Beth Crane. She gave me a Cortisteroid shot and told me no running for 14 days, 10 days at a minimum. Well that meant Silver King was out for me so I switched my Silver Rush event from the 50 mile run to the 50 mile MTB race. July 9th Silver Rush 50 MTB Race: I raced Silver Rush the previous year so I knew what to expect. They say it is the same as the Leadville 100 but with all the flats taken out. You are climbing or descending the entire time. I love this race because it is so demanding. 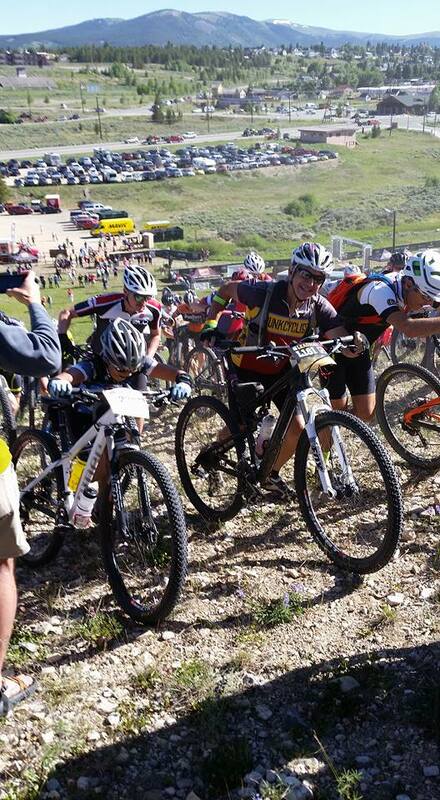 My goal was to finish under 6:30 as that would get me a better starting corral position for the LT100 MTB race. I started fast and was well under my target times to get under 6:30 through the first half of the race. I thought I had it all under control and would finish just under 6:30 until I was 2 miles from the finish and noticed they had added a new section of single track to the finish which ended up delaying my time to just over 6:30. I had taken it too easy thinking I had my goal in the bag. The Silver Rush 50 gang after the race, at the hill where it all started. 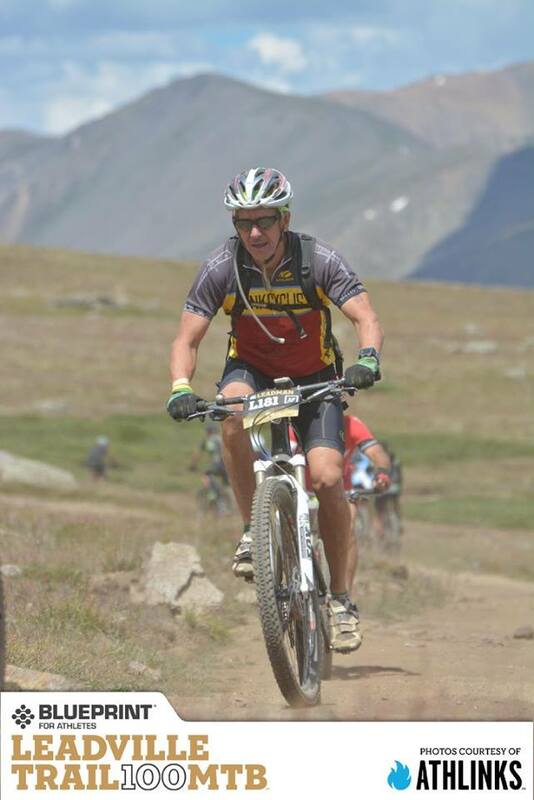 August 13th Leadville 100 MTB race: If you want to see what this race is aout you can rent the movie “Race Across The Sky”. The previous year I started fast, drank and ate too little thru the race and bonked at mile 80, yet I still finished under 11 Hours. I was also in much better cycling shape. My strategy this year was to start easier eat and hydrate properly and finish the last part of the race faster than I had the year earlier. I ended up finding out this slow start strategy does not work too well as you get stuck behind a line of slower riders that makes passing opportunities few and far between. I had fallen behind my goal pace significantly before I hit the aid station at the base of the huge climb to the Columbine mine. It was during that long climb to Columbine mine that I realized my cycling fitness was not the same as the previous year. During the last 50 miles of the race I was falling significantly behind my goal splits for a 10:30 finish but was still making all the aid station cutoff times. I had no idea that the sub 12:00 finish cutoff was in jeopardy until I got to top of the Powerline climb with about 20 miles to go and started doing the math in my head. I knew I was going to have to push hard to make it under 12 hours. The final 3.5 mile climb up The Boulevard to the finish was brutal, my legs were toast. A mile before the finish there is a steeper hill where spectators will run out and push you up the hill, I recognized the face of an Ironman friend from Ft Worth and called out to her and she immediately ran over and all 110 lbs of her helped try to push me up that hill. The street was lined with spectators, loudly cheering for us stragglers to beat the 12:00 cutoff During the final climb to the finish my heart sank when I saw the clock already had 12:00 on it. 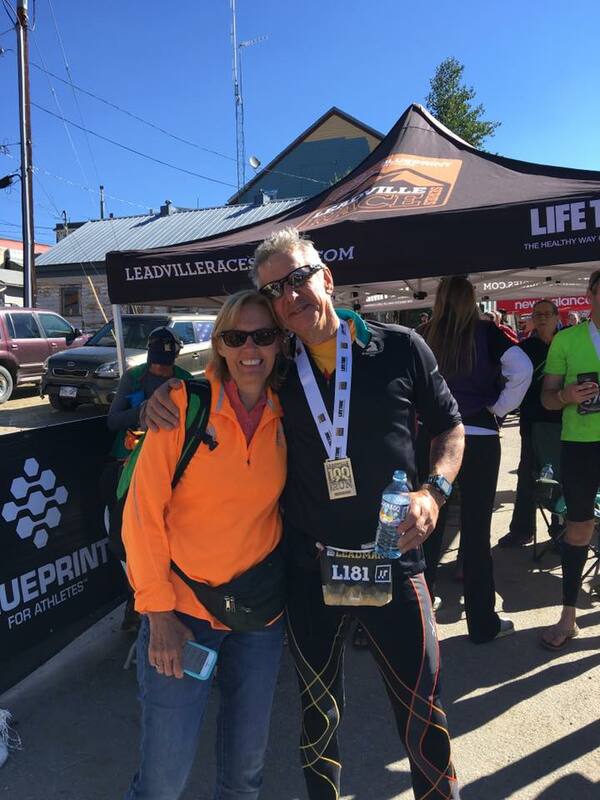 The Founders of the Leadville 100 race series, Ken and Merilee, both rushed over to me immediately and told me I still had a chance because it was chip timed. That didn’t help raise my spirits because I had started my watch a little before the start line and was sure my chip time was going to be about 12:00:30. Dejected, I checked on my other buddies racing. One had a torn tire that could not be repaired and withdrew from the race. Another missed the cutoff time at the Twin Lakes aid station at mile 60 on the return from Columbine mine, The third had a bad crash at mile 20 descending Powerline but was still on the course, and eventually finished an hour after the cutoff. Our group of 4 Leadman wannabes had all missed the required cutoff time and could not continue to race the other events as Leadmen. Bottom of Powerline descent with all my cold weather gear on. 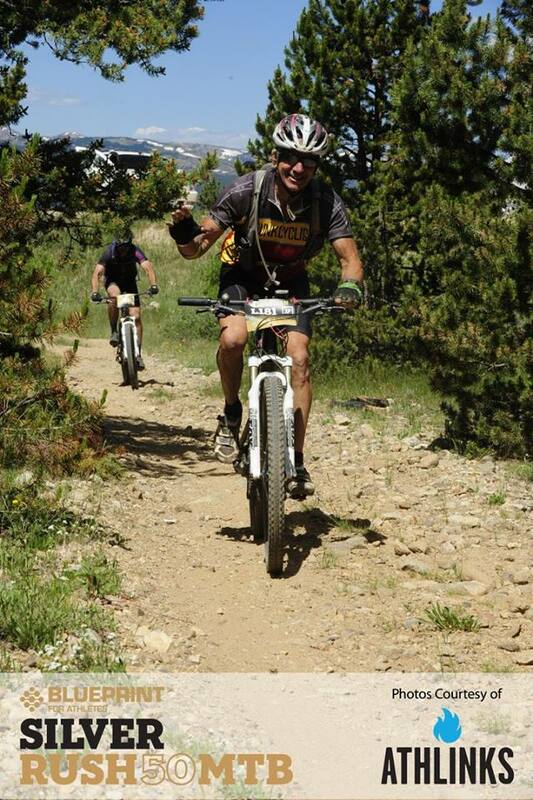 Up above the treeline on the Columbine climb. Coming back thru the aid station. Kim’s first time crewing me for any race. Crossing the finish line. Thinking total failure. My wife, Kim, and I had stayed at elevation in Estes Park and Breckenridge the week between the races. I also started a steroid pack routine to calm down my PF that week. 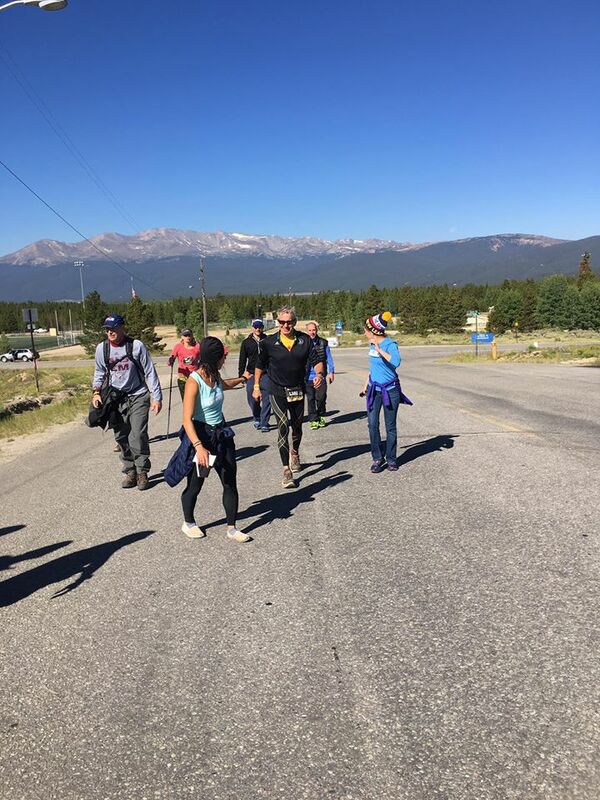 August 20th Leadville 100 Trail Run: Months before the race Drum had shared an aid station by aid station plan to finish the race under 30 hours that consisted of running about 40 miles and power hiking the rest. Basically, you run the flats and downhills and walk the climbs and later miles. I studied this 10 page document to the point of almost having memorized it. After the Jemez 50K I had serious doubts I could finish this race because of my PF and issues with my knees. In June I abandoned the 50 mile a week plan I had been following and began following the same training that Michelle “Drum” Blackard was following. 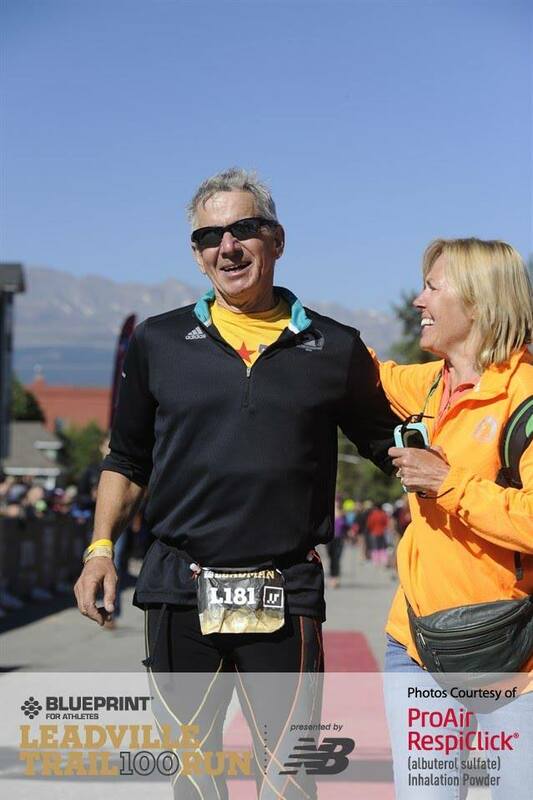 She had hired a coach for the LT100 run and his training focused on two good recovery days and strength and mobility work before and after each run. The weekly mileage was lower until the final peak before the race and there was a single harder run each week. Mentally it was a huge boost following this plan with Drum because she was training for the same race and I thought the reduced mileage might help keep my PF in check. In one of our conversations I told her my plan was to keep going no matter the pain until I missed an aid station cutoff. I asked none of my friends to pace me because of my doubts of even making it to the 50-mile mark. 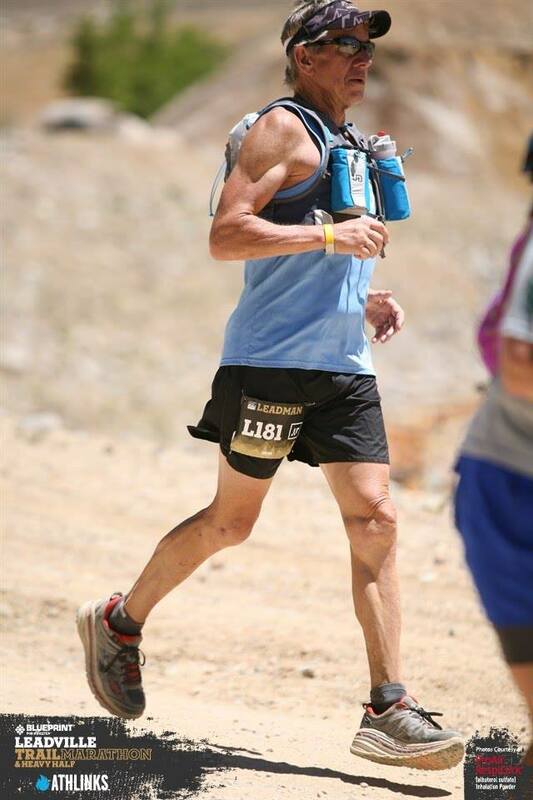 I would just have my wife Kim to crew me (her first time ever), and other friends would be there supporting their own runners but could help if they were still at the aid stations when I came through. 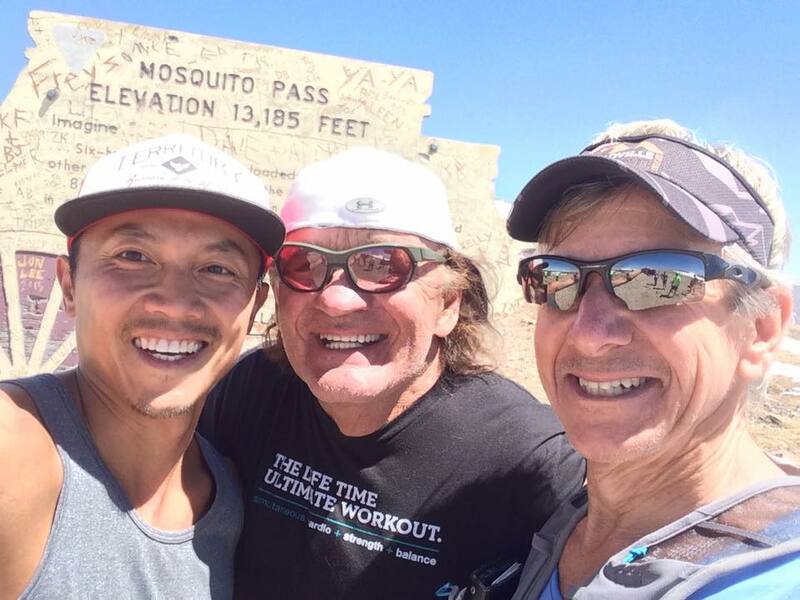 A few weeks before the race, an old buddy that lives in Silverthorne, had said he would come out and help Kim and pace if I needed it. A few days before the race I asked if he could pick me up for the last 13 or 24 miles not knowing what he was capable of and he gladly accepted the last 24 miles. I thought I might be able to find a volunteer pacer at mile 50 at the Winfield aid station or mile 60 at the Twin Lakes aid station. The day before the race I packed my drop bags for each aid station. I went to drop them off only to find I was given mis-information on the drop times and the trucks had already left (I laughed about this as it always happens if I don’t check the race guide myself). I scrambled with a new strategy of Kim having the bags at 4 aid stations and Drum’s crew having one at another. That night might have been the first night I have ever been able to sleep before a big race. Two nights earlier I hadn’t been able to sleep at all due to shortness of breath from the altitude acclimatization and I suspect that helped me rest well the two nights prior to the race. 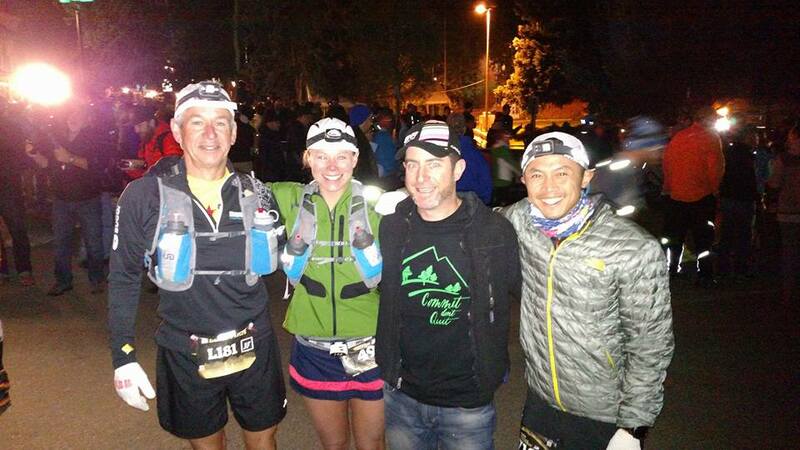 We all met at the start early the next morning and at 4:00 AM a shotgun blast started the race. I ran the first mile with Drum and Greg “Ninja” Sisengrath and then lost track of them. I had read a blog by an ultra-racer about how he used HR monitor to keep is pace slow enough during the first 40 miles so I adopted that strategy and just ran just below the top of Zone 1 which is 128 BPM for me. After 7 miles, I had to use the restroom, the early start was messing with my usual potty schedule. I knew there was one in the campground Drum was staying at on Turquoise lake so ran off the trail to take care of bidness. After getting back on the trail I assumed Drum and Greg had already passed by and found myself behind a pack that was running significantly slower and there were very few places to pass on the single track around turquoise lake. The Mayqueen aid station is at 13 miles when you get off the single track around the lake. When I ran thru and I slowed for hugs and kisses from my friends that were crewing other friends running, ditched my headlamp, got some food, and continued, finally able to run to my goal heart rate again. When I got to the Outward Bound aid station at mile 24 my legs felt remarkably good and although I could feel tightness in my PF there was no pain. I was developing a blister on one of my big toes so I had to stop to tape it and changed shoes to see if that would help. Kim was there to help and got assistance from another friend, Dat, who was crewing Greg, and Byron Benoit who was the designated floater supporting about 10 different runners. 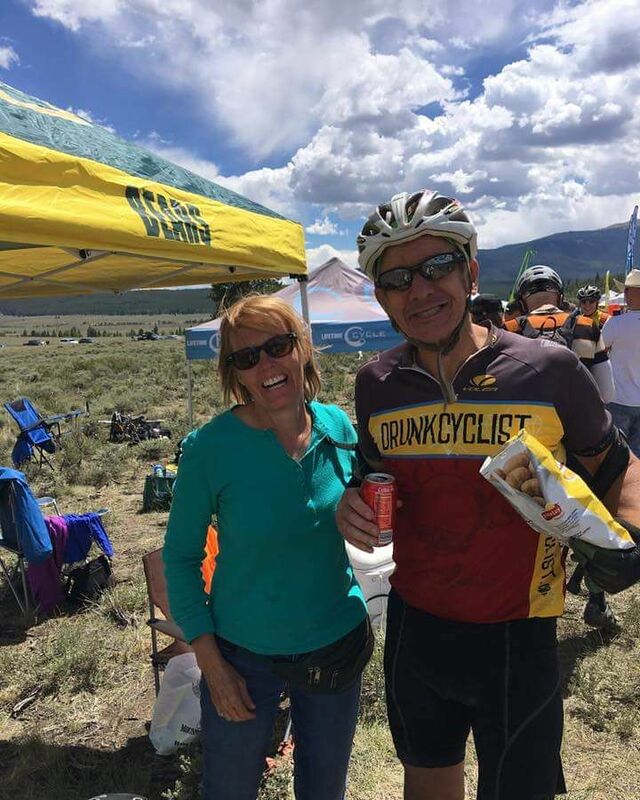 Kim had begun Byron’s ultra-crewing school and I would see her again at the Twin Lakes aid station at mile 40. I still felt pretty good rolling into the Half Pipe aid station at mile 31 grabbed some food and ran into Nora, a friend Drum had made earlier in the week. She and I ran together until I started having knee issues running downhill about a mile before the Twin Lakes Aid Station at mile 40. 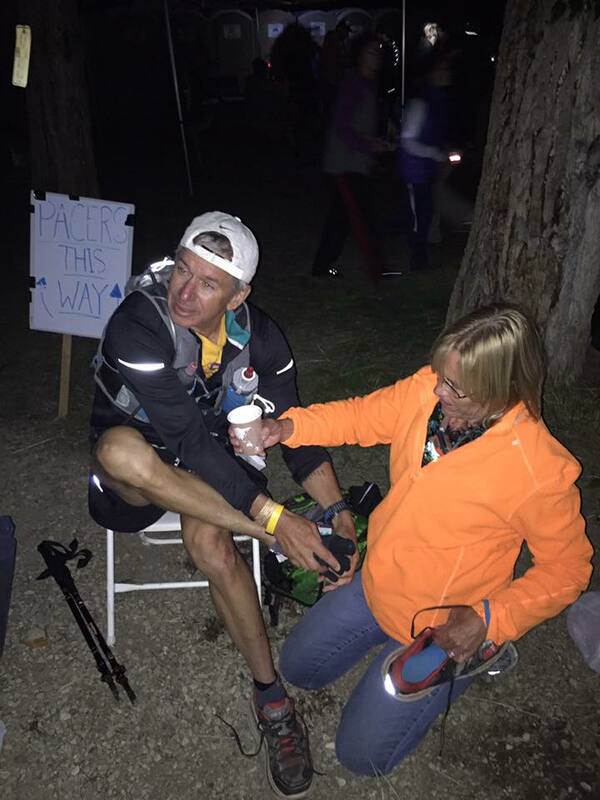 The shoes I had switched into were rubbing the back of my achilles and when I walked into the Twin Lakes aid station Kim and I went thru the shoe change ritual once again. I had arrived 1:45 before the cutoff time so I thought I was doing OK despite the knee issue which began to worry me. Byron was there as well and told me our friend Amy Ewing had dropped from the race and asked if I wanted her pacer Yolanda “Yoli” Combs to pick me up at the Winfield aid station at mile 50. I emphatically replied yes. I later learned that when Amy had dropped she had demanded that Yoli should come pace me and that Yoli was worried if she was going to be able to keep up with me. (see the quote at the beginning). Kim and I at Twin Lakes outbound. Can you tell who is the boss? I left Twin Lakes with my trekking poles for the hike up and back over Hope Pass, with the relief that I would have Yoli with me on the way back. Greg caught up with me leaving the Twin Lakes aid station, I had thought he was ahead of me all this time. We ran together then caught up to Nora and started the hike up to Hope Pass together. Eventually we caught up another friend Roberto Hernandez who was having a rough time with the altitude. Tried to encourage him some but he started falling behind. Nora was having a hard time with the climb too so I gave her one of my trekking poles to help her. Greg kept up his pace and left us as I hung back with Nora stopping occasionally for her to rest. Nora and I stopped briefly at the Hope Pass aid station which is just below the summit. There were lots of people there having issues with the altitude. We continued on to the summit and when the descent began she gave me my other pole back and I told her to go on without me, I couldn’t run down the descent because of my knee pain and there was no reason to hold her back. During my walk down to the Winfield aid station I saw several friends making the return trip back up Hope Pass and rooted them on. I arrived into Winfield just under an hour before its cutoff, not being able to run down descents was slowing me. When I got to Winfield I really wanted to eat a lot, Byron, and another friend Jered, asked what I wanted told them potato soup and Ramen, I failed to tell them I wanted a lot of it. Yoli joined me and Byron was pushing me out of the aid station, Jered caught up with half a cup of Ramen and half a cup of potato ships because they had run out of potato soup. My mind was saying WTF I want to go back in eat more, but they kept pushing me out of the area. On the way out of Winfield we saw a few more friends on their way in. Later I learned they did not make the cutoff time there. My knees were fine on flats and climbing so Yoli and I powered up to Hope Pass then gingerly down the other side. A few miles outside of Twin Lakes Drum came flying by us by herself. She had taken her pacer, Erik’s, headlamp and he was running in the dark. Yoli and I were trying to share our lights with another runner that did not have a headlamp when some other guy without one caught up with us. I looked over to see it was Erik. His gaze was straight forward and he did not recognize me. I gave him some guff and it took about a minute for him to realize it was me. I got a great laugh before he took off ahead of us, without a headlamp trying to catch back up to Drum in total darkness with three stream crossings ahead of him. 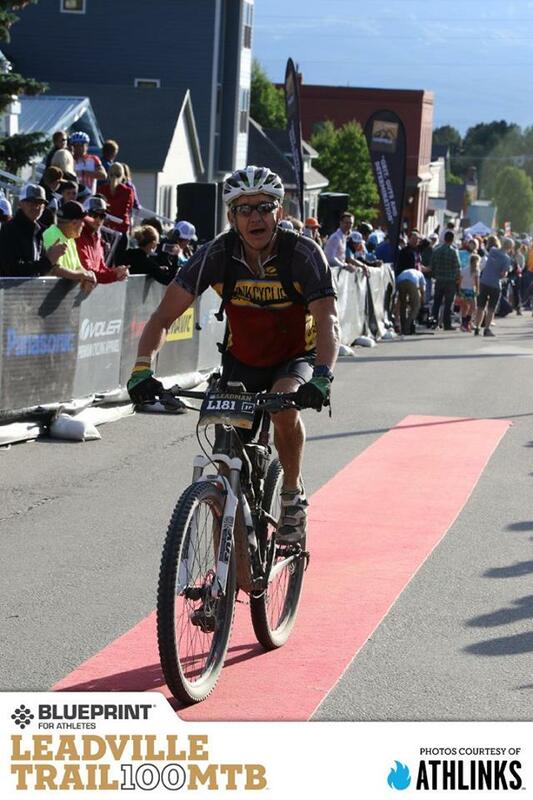 When we arrived into Twin Lakes, Kim and Byron frantically pushed me to get thru the timing gate. I was in 12 minutes before the cutoff time and went back to eat and change shoes once again since my shoes were wet from the stream crossings. I had gone from 1:45 before cutoff the first time I hit Twin Lakes to 0:12 before cutoff coming back. Kim in action at Twin lakes inbound, mile 60. Not being able to run the descents was killing my time but I was still able to run flats and power hike up the climbs without pain. A few miles later we had caught back up to Drum and her new pacer Kelly Brown. I was looking for any excuse I could find to walk but they would start running and eventually I’d think wait I’m your running buddy, we run together all the time. We’d run to catch them until they started walking again or pass them, they’d pass us again. We played leapfrog most of the way into the Outward Bound aid station at mile 76 this helped me get back a bunch of time so I was almost an hour ahead of the cutoff time getting into Outward Bound. Yoli later told me the last few miles before Outward Bound I was running off trail and she would have to bring me back on the trail and I was hallucinating a little. During the entire 26 miles (9 hours) I ran/walked with Yoli she pestered me to drink and to think about the Leadman pick axe that I would receive if I finished under 30 hours. Kim, Byron and my new pacer Guy Grosgebauer were waiting at Outward Bound. I put on running tights and a heavier jacket because it was getting cold. Un beknown to me Byron had taken Yoli and Guy aside so Yoli could brief Guy on how I was doing, or how screwed up I had gotten. Guy had come packed for bear. He brought everything he thought he would need to feed or drag my rear across the finish line. We started up the Powerline climb about 2:30 in the morning. The last two times I had gone up Powerline it was pushing a bike in the MTB race and the lack of having to push 27 lbs up that steep slope was rather invigorating. Most of the remainder of the race was walking or a very slow shuffle. Guy kept me awake by telling me all the escapades that were going on with his mountain home renovations. I might not have been listening much but the constant chatter made time go by quickly. 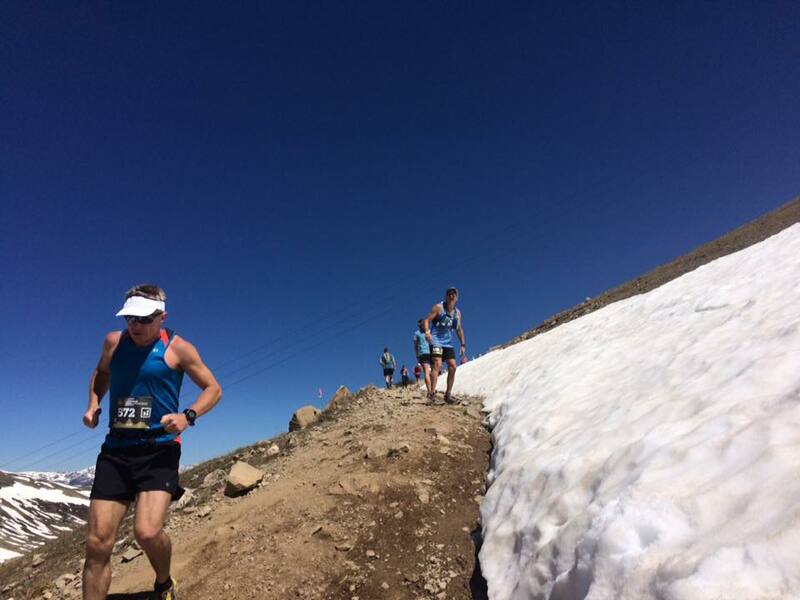 The descent from the top of Poweline to the May Queen aid station (Mile 87) went on forever. My headlamp was dimming and it seemed to take a lot longer than it did on the bike a week earlier. We arrived in May Queen as the sun was coming up and I ditched my headlamp and jacket. As we were leaving we ran back into Drum and K2 who was pacing her then. I asked Drum if she wanted me to run with her and she said she was fine to go ahead. I was back on the single track around Turquoise lake but man it felt like it was taking so much longer to get around then the first time we had gone out. We’d have runner pass us that would motivate me to push a little more, I’d run a little then start walking again. We finally got over to the campground where Drum was camping and I saw her dad and told him she should be just behind me. A few miles later when we were just getting off the single track a guy told us there was only 5 miles left, we later found he was off by about three miles. About then I started hearing K2’s familiar chatter behind us. One more steep descent I had to walk then it was all flat or uphill from there. Drum and K2 caught up to us then passed us. We were discussing how much time and distance we had left and the guy that told us 5 miles was off by a few miles. One of the other runners along the way was a guy from San Antonio I had been talking to 26 hours earlier when I got stuck behind the slow group heading out. I saw a familiar Tejas Trails shirt on a girl from Austin and later found out she was going for the Grand Slam of Ultra running. When we got to the base of The Boulevard I know we had less than 4 miles to go. I tried to remember the turnaround point for the 10K so I’d know when we had 3.1 miles left but couldn’t remember it. I thought we were going to be close to the cutoff time so started to walk with a purpose. I told Drum I thought we needed to pick it up some and tried to help her by pushing and pulling her. Then Byron and another friend, Jason, came down about a mile or so to find us and gave us an update on distance and time left. It was clear we would finish under cutoff walking it in. I gave Guy a hug and told him thanks I couldn’t have done it without him. More friends had joined our walk in, Jered and Linda who had rushed me out of Winfield so quickly walked with us and I gave them big hugs. Then Yoli ran up and I gave her a huge hug. When she mentioned the axe my tears began flowing, thinking about the journey, about all the doubt, and most importantly about all the great friends I had out there supporting me, pushing me, making sure I was a Leadman. Then I saw the finish line about 400 meters away, but there was another runner in front of me with his crowd. 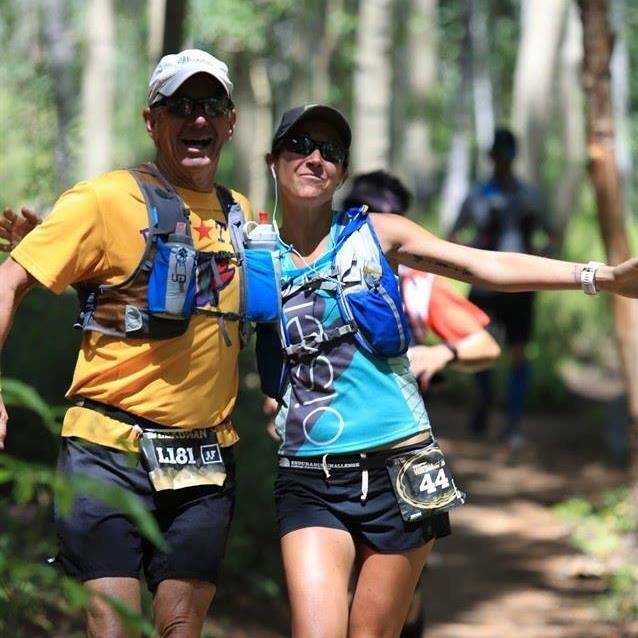 As hard as I tried in the last 13 miles it was near impossible to run but there in that last 400 meters I found the strength to catch and pass him, and get a hug and kiss from my biggest supporter, Kim, the newly indoctrinated ultra-crew manager. Crossing the finish line with my biggest supporter. The love from this woman! Me and one of my best friends after another epic adventure. Never could have done it without her support. In hindsight passing that guy was probably a jackass thing to do, but…..
You’re never going to be 100% ready and it’s never going to be just the right time, but that’s the point. It means that every moment is also the right moment. If you want it, you just have to do it. So many miles together! We earned MTB buckles last year and running buckles this year. This entry was posted in Cycling, Running. Bookmark the permalink.